As previously announced, our third volume of Waywords and Meansigns will include a number returning contributors from past years. 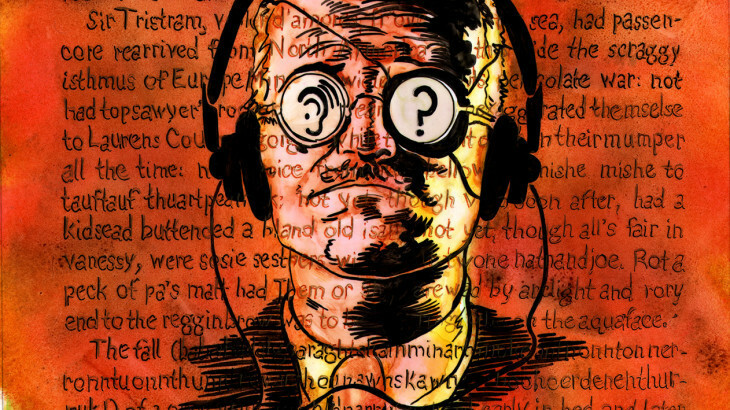 Whereas we formerly focused on very large pieces – each contributor to our project set an entire chapter of Finnegans Wake to music – contributors are now focused on much shorter passages, a page to a few pages in length. There are many things that can be done with a mouth. None of them as fun a literary challenge as Finnegans Wake. For my second incursion into the Waywords Meansigns project, I collaborated with Hitori Tori, an electronic musician whose digits dial up all manner of frenzied altered states. As I read, Jules whipped up a pentatonic scale of unique sounds perfectly improvised for the text. I hammed up a British accent and Hitori Tori layered it into a full sonic sandwich of texture and time. I jumped at the opportunity to engage in another creative exploration and interpretation of Finnegans Wake. This go-round was very different than the first, though still lots of fun… Instead of 88 pages, we took on three, allowing us to plunge into the material, study the meanings, references, and context… Unlike the first reading where the goal was just to make it all the way through the selection, this time we recorded many takes for each section, with different inflection and emphasis. With so many repetitions, [Scott Rhodes, Luke Sanders-Self, and I] eventually started memorizing passages like “A spathe of calyptrous glume involucrumines the perinanthean Amenta” and reciting them aloud in the most ridiculous voices… Letting those kind of lines seep into your mind, you start to feel the incantatory magic of the Wake’s language. It affects the way you see the world, the way you hear language, it proliferates the Joycean perspective of epiphany. It’s extraordinary, to say the least. Finnegans Wake reads a lot like a graphic score. The text jumps off the page and in contrast to your typical prose novel has a musicality of its own. I couldn’t ignore the opportunity to set a portion of it it to music for a second time. What drew me to this incarnation of the Waywords and Meansigns project was the self-contained conciseness of the selections. Having had the experience of creating epic music for an entire chapter in the second edition… it was great having stricter limits. As before, though, composing for Finnegans Wake, even on that smaller scale, presented the challenge of setting to music what is already music. With each reading or creative approach to Finnegans Wake I learn more and am allowed to access it a little better. The poetry of the book is so rich and dense that the book seemingly never exhausts itself — so a fresh creative approach always presents surprises and learning. Everything started with a strange message from a total unknown Twitter page. Someone was writing to my band’s account something about a full transposition of the Joyce’s Finnegans Wake and I was thinking about the foolish plan this guy, supposedly a guy, was making. I accepted, but not with my band. I decided to go on and try out making music with Ale… we managed to let music tell us what to do. It was something different from the canonic composition. We set three hours of music down and 78 pages, less or more, with synthetic voices and electronics. Derek after a year came to me asking for a new last finnegadventure and I totally accepted. This project is so sick. I return to this project over and over again, and listen and experience this text almost on a daily basis. Being far from finished, myself, where once I cursed Joyce for this infernal text, I thank the gods that he had the genius to create it, so dense, so subtle, and so outrageously sophisticated for anyone, or hardly one, to study and through which to somehow measure my life. I’ve decided to participate again in the project because I wanted to explore deeper what I started to scratch with the first edition… The track starts with the narration itself, with some concrète objects providing an accompaniment, then it builds around a circular guitar riff on top of what are layered different noises, glitches and drones, always in a recurring fashion. Those sounds are then processed with some EQs and effects, to enhance different aspects and qualities of the material, trying to give the whole piece a “crescendo” feeling. The voice doesn’t fade away after the reading is concluded, but returns as a decoration, reverberating throughout the whole piece. When I heard word from Derek about the possibility of an edition of shorter excerpts from Finnegans Wake I got straight to recording the song section of the ‘Ondt and the Gracehoper’ fable. I wanted to mould the sound to themes of the words, and worked backwords from “Holy Salmartin, why can’t you beat time?”, creating a tempo that can’t settle itself “in time” but exponentially increases throughout the piece, burning itself out at the end. I thought that this would convey the beautiful (at-least-)double meaning of the line: the inabilities to both beat time musically, and temporally (time will always win). It was intriguing to find out that I was a human contributor whereas the voice on the previous piece was electronic and programmed. So the human feeling I had was that the text seemed initially impenetrable but actually the words said aloud feel natural, funny and over-the-fence-gossipy. The random asides offering cooking tips, life advice, philosophical wisdom, character building and assassination felt like pricking pomposity and being joyously pompous at the same time.